Windtraveler: Leaving Your Boat in the Caribbean? Go through every single storage compartment and de-clutter - this is incredibly time consuming, and incredibly cathartic. We got rid of a LOT of unused stuff on our boat and made a TON of space for baby! Empty holding tank, flush with fresh water, treat with chemical - holding tanks are beyond nasty, and doing a fresh water flush will ensure we don't come back to a cesspool. Top off diesel tank, treat with biocide - any vented container with a liquid in it has potential to be contaminated by water and heat, by topping off the tank and keeping it full there is less room for contamination to occur. In cold climates, topping off the tank will help curb condensation. In warm climates, it will help to slow the growth of algae. Biocide is a chemical that will also kill any algae that does begin to develop. Shut off motor battery - won't need that for a while! Confirm solar panel is trickle-charging - we are not hooked up to shore power and want to make sure our house battery will always be trickle charged and full enough to run our bilge pump. Also, trickle charging your batteries when not in use will extend their life significantly. Shut off propane solenoid on boat and on tanks themselves - gas leaks are no bueno. Remove halyards and run messenger lines - we have another post on how damaging the sun can be, but believe me - UV rays are REAL people! Leaving halyards on the mast exposes them to harmful UV rays day in and day out and by removing them we're adding life to our lines. Clean head - after I did the fresh water flush of the tank (by running a hose to the toilet and continuously flushing fresh water into the tank) I thoroughly cleaned the toilet. Salt water left in a toilet will turn to a disgusting brown/grey slop in a matter of weeks. We left our toilet totally dry and scrubbed clean. 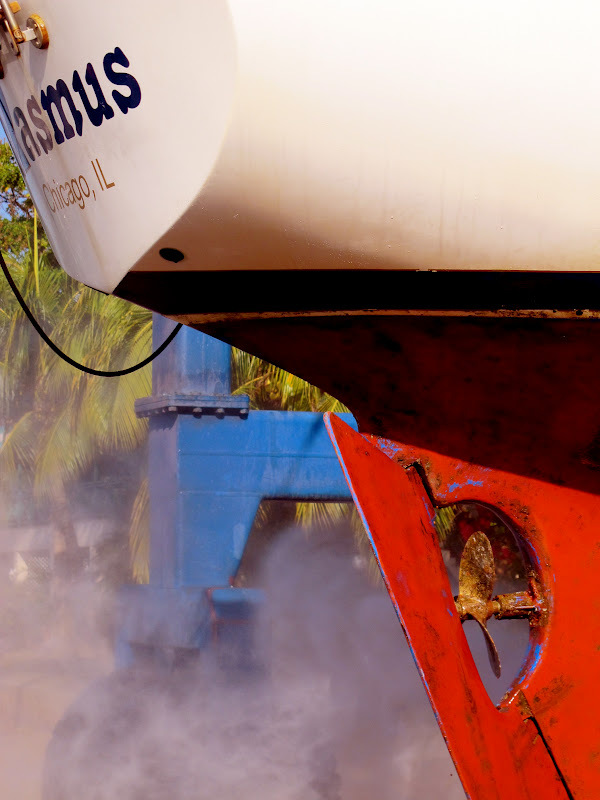 Power wash hull - most yards will do this right when they haul your boat out of the water. We are planning on re-painting the bottom of our boat when we return so it's good to get all the growth and as much old antifouling off beforehand. Store outboard and all other loose items on deck down below - this is more for theft reasons than anything else. If you have something on deck that might be tempting to a thief, stow it down below! Remove and clean all sheets and dock lines, hang on boom - we used detergent and washed and scrubbed all our lines, they are now salt free, soft and clean for when we return. We hung them on the boom so they get air - better than leaving them all stacked on top of one another in a dark, damp locker. Clean fenders, store hanging on boom - fenders are bleached and scrubbed and back to their former glory. We also stowed these on the boom. Empty and clean ice box, leave open - iceboxes, in particular, need ventilation when left unused for long stretches of time. Pickle water-maker - they say water makers are fantastic and reliable as long as they are used regularly. When not in use, you must "pickle" them so that the sensitive membrane inside doesn't dry out. Luckily, our water maker is not only a breeze to use (we cannot sing it enough praise), but a breeze to pickle as well. Most pickling routines are incredible confusing but ours was a matter of changing out a filter. Some kits will preserve the membrane for 4-6 months, others for 6-9 months. We are going to have ours re-pickled in 4 months to be safe. Clean and store all silverware in ziplock bags - we did this for two reasons, 1) to protect from the bug bomb we let off and 2) to keep dry and free from rust. Store cleaning supplies in a bin to contain any spillage - we did this because when we were on the hard in Chicago we had a Windex bottle burst and stain our table. Remove all garbage, clean containers - "clean containers" is the operative phrase here! Make sure to wipe down the insides of all bins with bleach or vinegar, you'd be surprised where little pieces of food might be waiting to turn into a science experiment. Clean and store clothing/sheets/pillows and pillow cases in sealed bags - people who live on boats seasonally are very familiar with "boat smell". It's not very nice. We washed all our towels, sheets and clothes and stored them in sealed zip locks with dryer sheets. Clean and store carpets in sealed bags - again, doing this will ensure we don't turn into a moth motel and return to clean, mildew-free carpets. Turn up all cushions to keep free from mildew - when a boat is closed up, ventilation is key. We turned up all our boat cushions to make sure they get some air. Moss doesn't grow on a rolling stone and mildew won't grow where there is air flow! Confirm bilge pump is on in “automatic” position and working - this can be done by pouring a bucket of water in the bilge (which you'll do to clean it, right?) and making sure it works. Clean all overheads and walls & wipe down with vinegar - vinegar retards the growth of mildew, we wiped down pretty much every single surface of our boat with a 50/50 mixture of vinegar and water. Dehumidifier - if you haven't noticed, mildew is a big deal on a boat down in the tropics and a never-ending battle. We bought a small dehumidifier that will help keep the interior of our boat moisture-free so that we don't return to Jurassic Park. Close all curtains - yep, UV damage can even sneak in through windows, hatches and portholes. Cover them up! Cover boat deck to protect from UV damage and weather - I wrote about our tarp yesterday, this was a no-brainer for us. Remove sails store in an air-conditioned sail loft - the sails on Rasmus are just two years old and we want to keep them in good condition. For less than $10 a month we stored our sails in an air-conditioned sail loft right near the boat yard. Wash decks - a boat that is left nice and clean is a happy boat! Fumigate interior with insect bomb - while we never saw another roach (or any sign of roaches) after this incident, we did have some tiny ants aboard. We fumigated with an insect bomb right before we left and we're pretty sure we nuked the bastards. Grease boat stands to prevent bugs - We bought standard grease from the chandlery and put a thick coating along the top of every single jack stand. The reason for this is that if any ants or bugs want "in" to our boat via the stands, they'll be stuck in the grease and unable to get aboard. Tape off hole at end of boom to prevent birds from nesting - we know people who this has happened to before and rumor has it, it ain't pretty. Place ant traps and roach motels throughout - just in case. Check/Top off engine oils - if you are due for an oil change you should do this as well. Clean and clear all through-hull openings, close seacocks - but be sure to leave open the seacocks for the scupper drains and sink if you are going to have a dehumidifier on board. Store dinghy on tarp on bow - while some people keep the dinghy on the davits, we opted to store ours on the bow over a tarp so it too is protected from the sun. Remove dodger & bimini canvas, clean and store in watertight bin - believe it or not, we found the best way to clean our canvas was to simply scrub them with a stiff brush while dry. They look brand new! Arrange yacht guardianage for weekly/monthly checks - we have a boat service that will board Rasmus at least twice a month to make sure everything is still in working order. They will wash the deck, check the dehumidifier and bilge and read the battery meter to ensure we don't run our batteries dead. We chose Dynamite Yacht Services to do this but there are plenty of others. Email list of approved vendors/persons to Peake Yacht Services - we are in the "high security" area of Peake Yacht Services which means that no one is allowed in or out who is not approved. It's an area where you cannot have any boat work done, no one can livaboard and where angry looking dogs roam at night. We had to send a list of approved persons who will be able to access Rasmus while we are away. Go home, have a baby, and prepare for life as a crew of three! I guess this one applies only to us? Have you ever left a boat down in the Caribbean for any length of time? What did we miss? What was the bottom growth like when you pulled Rasmus? Curious to know how it compares to a season of use in the Great Lakes. We also flush our engine with fresh water when storing on the hard. We found the easiest way to accomplish this is to just disconnect the raw water hose from the seacock and drop it in a bucket of fresh water. Then we run the engine for several minutes to draw fresh water through the system. We'll drain the water and replace the engine anode when it's time to launch. Wow, lots of good info! Sounds like Rasmus will be ready to welcome the three of ya'll! Wow! What a lot of work it takes to put a boat to bed. We've printed out this list and will certainly use it as a reference later. Thanks so much for writing about it all! Disconnect the gas tank and run your outboard until it quits to prevent gumming the carb.